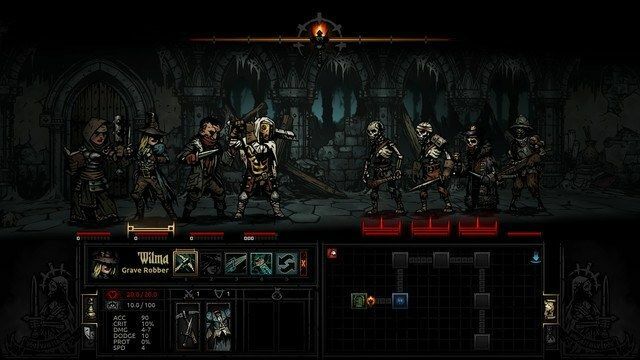 The crowdfunded Darkest Dungeon is finally out in full retail form for PC, and it's everything you've ever wanted in an extremely difficult dungeon crawler. 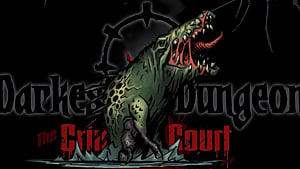 The deadly combat and dark atmosphere bring to mind the Warhammer pen and paper RPG, while the backstory and enemies are Lovecraftian to the max. A very satisfying combination. 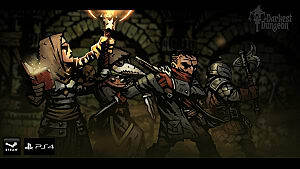 Since your party members will be dying frequently, coming up with new and more useful party combinations for any given area of the game is a huge key to successfully making your way through the Darkest Dungeon. In general, you always want someone with healing capabilities and ranged attacks in the back (slot 4), a serious front line damage dealer at the front (slot 1), and then any combination of ranged and front line damage classes in the two interior slots, with some utility skills thrown in for good measure. That's a solid plan for a well-rounded party, but as we'll cover below, sometimes you also want to throw balance out the window and go for broke instead. Keep in mind that the best party makeup completely changes depending on location. For instance, there are less undead in the forest, so your crusader who does bonus damage to undead is less useful there. Fishmen, on the other hand, take less bleed damage, so characters focused on bleeding abilities aren't particularly helpful at the cove. No matter how meticulously you plan out your lineup, there really isn't a perfect party combination, simply because of the game's many nefarious methods of throwing a wrench in the works. Your marching order will get rearranged against your will due to surprise, enemy attacks will re-position your ranged characters to the front row or stun your healer just when you need some extra health, and so on. 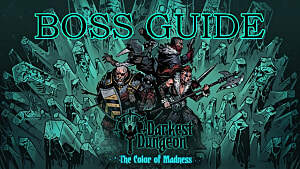 To build the best party, pay careful attention to each hero's quirks, which are randomized and can change over time either by using curios in the dungeon or gaining new quirks at the end of quests. A Crusader with the Unholy Hater and Ruins Tacticians quirks, for instance, will annihilate undead in the ruins area and can carry the whole party if you keep him alive. Its also important to note the effectiveness of these combos can change drastically depending on how far you've upgraded any given hero's skills and equipment. Upgrades aren't cheap, but they are important. Trinkets can play a huge role in changing a party's utility as well – a group outfitted with speed boosting equipment is going to get off the proper attack combinations more effectively than a starting group with nothing special equipped. This is the basic starter group of dungeon delvers you'll likely build when first getting access to the trade caravan, and it remains surprisingly effective for many different areas of the game. 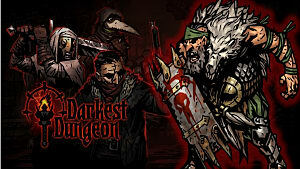 The Vestal can handle healing and ranged attacks of course, while the Plague Doctor offers stun abilities and corpse removal. The Crusader and Highwayman can switch off, with the Highwayman taking the front to use Point Blank Shot when facing anything other than undead, or using Open Vein against those enemies with high protection values. 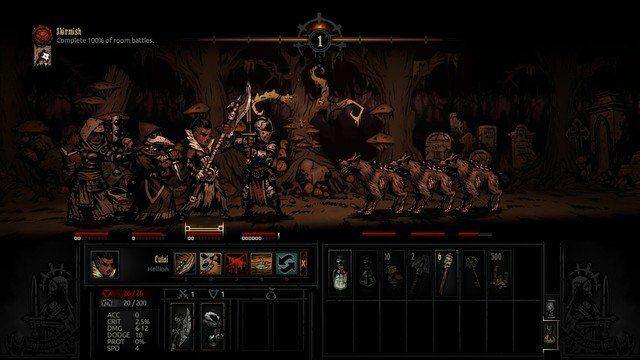 While there's a good deal of balance here, there are other Darkest Dungeon party combos that are much more effective in specific locations or against particular enemies. The party that stuns together, stays together! This party combo is all about preventing the enemy from getting to attack at all. Half your group will always be devoted to stunning the enemies, while the other half will be focused entirely on dealing as much damage as possible before stunned monsters can recover. 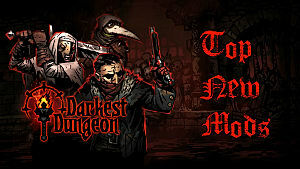 The Plague Doctor should be using Blinding Gas every round to stun the back row or Disorienting Blast to hit the second slot enemy and clear out corpses. The Bounty Hunters use Flashbang for stunning or Finish Him to deal extra damage against stunned enemies. Your front row Hellion can also stun with Barbaric Yawp, but ideally she should be mopping up those stunned enemies with Wicked Hack or Breakthrough. This can be a devastatingly effective composition – but it's rendered significantly less useful when facing monsters with high stun resistance, or if you don't have the right trinkets to increase your chances of successfully landing the stuns. This insidious party combo is all about draining every enemy with bleed effects every round, which is incredibly useful against monsters with high protection levels, as bleed isn't affected by the protection stat. Your front line Hellions should, of course, be deploying If It Bleeds whenever possible, while the Hound Master takes advantage of the Hound's Harry skill. 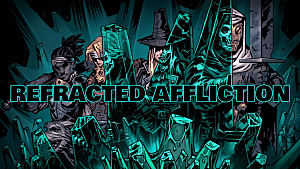 The Occultist offers up an interesting bleed effect with Wyrd Reconstruction, which actually heals a party member better than the Vestal can, but has a chance to cause bleeding damage, so make sure you've got resistance to bleed effects yourself! Against low health enemies where bleeding effects aren't useful, the Hellion's can still make use of strong normal melee attacks. Abominations are incredibly potent in combat when transformed into beast mode, but they are balanced out by the fact that each transformation increases your party's stress. Several other classes will refuse to associate with Abominations at all – including the Vestal, Crusader, and Leper – and simply won't join a party containing a hero with this class. To make the most of these powerhouses, put two Houndmasters in the back row, as their Cry Havoc ability removes stress, offsetting the Abomination's main drawback. 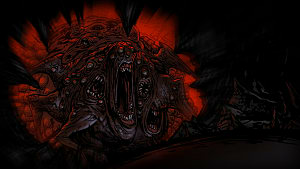 This is also a great self-sustaining party, since the Abominations can heal themselves, either by using the Absolution skill or simply by transforming back into human mode. Point Blank Shot can be a very useful front line combat ability, while the Highwayman's Grapeshot Blast also offers area of effect opportunities when needed. Deploy the Daemon's Pull ability of the Occultist to position the toughest enemy up front for your next Point Blank Shot. 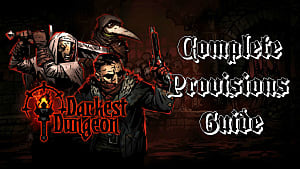 The Vestal keeps everyone alive, but for a twist, swap her out with the Plague Doctor, since that class can easily remove the corpses that will be made by Point Blank Shot and has the added utility of stun abilities. This squad of heroes is focused on taking on tough, high HP and protection enemies, rather than large numbers of weak enemies. The idea here is to have half your team marking an enemy, while the other half uses abilities that deal much more damage on marked foes. You need some versatility here between ranged and melee attacks though, which is why two Arbalests and two Bounty Hunters works out best, as both can mark and both deal extra damage to marked opponents. Alternatively, you could swap out one member of the group with a Hound Master for a little more utility. Go wild and try out some unique party combinations! These were the party combos we've been having the most fun with or found the most useful. 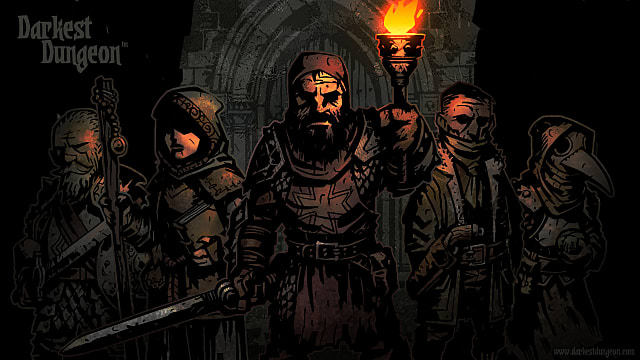 Be sure to let us know your favorite party combo that makes delving into the Darkest Dungeon less difficult! Vestal - Vestal - Lepper - Lepper. Stright Forward, but works with the Masive boss in the front line. Ocultist, Grave Robber, Lepper, Hellion. Stunt, Front Line destroyer, and dissabling and blighting 3th and 4th possition. All girls: Vestal, Grave Robber, Hellion, Hellion. first round: Kill 4th, Stunt the 1 and 2nd, stunt the 3th and blight the 3th. Deadly, and can handle a boss in the 4th possition like the sonorous prophet or aprentice necromancer, or the Hag. 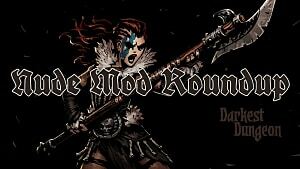 Hound, Grave Robber, Man at Arms, Hellion. Good vs the Hag. With all cappable to deal masive damage in the 3th - 4th position. Hnng, I love this game so much! Great suggestions for parties! I definitely find a lot of fun in mixing things up and trying new parties on my own. I'd suggest a tweak to the Abomination party: swap a Hound Master for a Jester for a little extra utility and alternative stress healing. As the game progresses and units get pulled/pushed around more, the Jester's mobility can really save your momentum and make sure the Aboms are well positioned. It's pretty amazing - I've been playing non-stop since picking it up. I might have to update this at some point with a few more combos. I've been using the Leper pretty heavily lately. He's already got great base damage, and can deal even more if you burn a turn to use his upgrade skill, but where he really shines is in the ability to heal himself. He's an excellent front row damage dealer for when your crusader or man-at-arms is locked up in the sanitarium for a week.